Attract new talents to careers in nuclear. Develop the attracted talents beyond academic curricula. Increase the retention of attracted talents in nuclear careers. Involve the nuclear stakeholders within EU and beyond. Sustain the revived interest for nuclear careers. 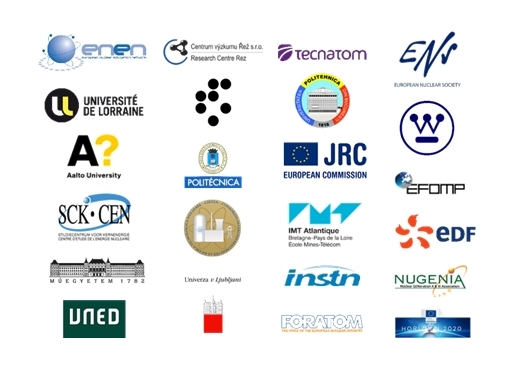 Integration of further nuclear disciplines (e.g., nuclear chemistry, decommissioning, fusion engineering…) and sustainability of the ENEN+ accomplishments beyond the project life of is foreseen within the existing ENEN Association and its members and partnering of ENEN association with existing ongoing and future projects. The attraction, retention and development of the new nuclear talent can only be sustained beyond the project life through strong partnership of all nuclear stakeholders. Involvement of various nuclear stakeholders including academia, industry, international organisations and Technical support organisations is therefore of primary importance for the success and sustainability of the proposed activities also beyond the life of the project. ENEN+ establishes a mobility fund of 1.000.000 EUR for European students, researchers and learners. The overall strategy of the ENEN+ work plan is to build a large collaborative effort integrating resources from university, research centres, industry and international organizations such that the common results obtained will deliver effective means to support education and training in 4 major nuclear fields. To achieve the objectives the project is divided in seven work packages (WP’s). The work packages have been shared amongst the participants so as assuring a continual development of the project works. Attracting the interest of the secondary schools’ students on nuclear issues is the first topic of the project. The main objective is to provide these students with complete, straightforward and balanced information on nuclear energy and its applications. Indeed, there is a clear correlation between knowledge and support. Large parts of young public are still unaware of (or choose not to believe) the potential benefit of nuclear in their normal life (e.g. medical applications, reduction of carbon dioxide emission, …) and a fortiori do not consider nuclear career as an option. Work Package 1 deals with actions towards secondary schools students by i) making available reliable and honest information through dedicate web site and social networks, ii) organizing attractive competition in European countries where students will compete and present projects on nuclear topics at the national level and iii) organizing summer camp for the national winners where students will have the opportunity to be familiarized with nuclear applications and to discover nuclear careers. As for WP1 spreading information will be done through web based instruments. Work Package 2 is dedicated to university students with particular attention to bachelors. Indeed, in the most universities, bachelor level in science is cross-disciplinary and students choose their specialization at the end of this level. In addition, specialization in nuclear topics is often done at the Master level. Therefore, the challenge is to guide the best talent to nuclear specialties in this relatively short time frame that constitutes the first years at university. Specific instructional materials will be developed in generic nuclear topics and students will have the opportunity to enrol in mentoring program allowing taking benefit from academic support and career advising. 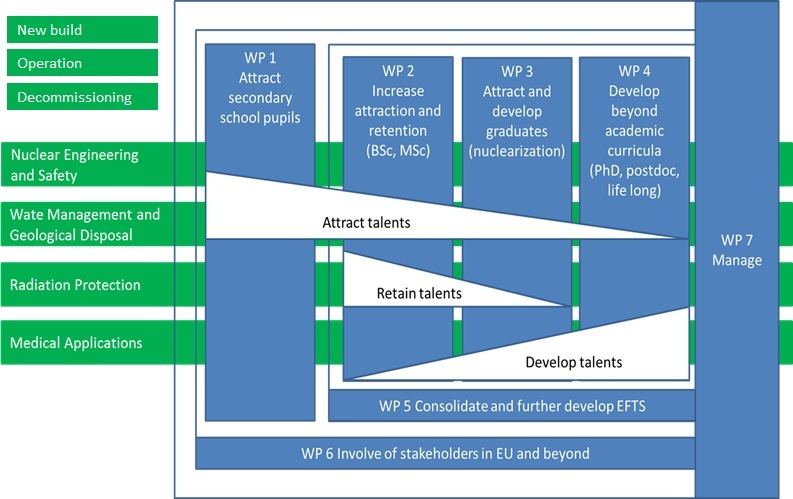 Participation in summer schools and the obtainment of internship in professional world financially supported by the ENEN+ project are among activities foreseen in WP2. Work Package 3 aims to attract non-nuclear workforce to nuclear fields. In this work package the prospective needs for human resources within next decades in different nuclear sectors will first be assessed and then the corresponding job profiles will be defined. Following the ECVET principle, training curricula will be specifically devised for the “Nuclearization” of professionals who have a formal education and training in a technical area outside the nuclear domain and mobility fund will be dedicated by the project to selected candidates. Particular attention will be paid to the level of qualified technicians as the present demand for this category in nuclear industry is about four times greater than for graduate level. While absolutely essential for the continuation and improvement of knowledge and even safety, the decrease in research activities in nuclear fields at the European level is a matter of course. Work Package 4 will develop mobility schemes to facilitate access to infrastructures and participation to EURATOM research project to enhance the experience and retention of PhD Students and post-docs . In order to wider the career perspective and better develop interaction between PhD students and industry, the project proposes the establishment of Doctoral Schools on Nuclear Innovation under the umbrella of ENEN Association. Work Package 5 will consolidate and further develop European Fission Training Schemes and Mobility. Developing life-long learning in nuclear is essential both for the continuation of competences and improvement of safety. The use of ECVET principles and approaches must be harmonized in different sectors. Until practical implementation of ECVET system in European countries, WP5 will propose a voluntary accreditation system that could be developed under the umbrella of ENEN Association. This could be applied to the existing sectors where EFTS is already well developed such as nuclear engineering, waste management and disposal, radiation protection and some medical applications but has also to consider other niche applications (e.g. decommissioning) for which WP5 will propose specific EFTS program. To be effective, the implementation of these actions together with those proposed in WP1,2,3 and 4 needs stainability in particular regarding the mobility grant. In conjunction with WP6, WP5 will strive to find a framework to ensure the continuation of the project outcomes beyond the project lifetime. Indeed, the success of the ENEN+ project relies greatly on the active involvement of stakeholders including industry and legislators. Work Package 6 will propose to build solid bridge between different players acting for the improvement of the recruitment in nuclear sectors taking benefit from the presence of major industrial partners in the ENEN+ project. Works in WP6 include communication with industry and legislators, development of education, training and knowledge management strategy and facilitation of access to internships. This project receives funding from the EURATOM Research and Training programme H2020, for 3 years under grant agreement N° 755576.